Kauai exudes all the charms of tropical island life. The pace is slow and relaxed, locals are friendly… and nothing stays open late. What it lacks in high-rises (no building is taller than a coconut tree) it makes up for with towering sea cliffs, deep canyon ridges and huge waterfalls. Only ten per cent of Kauai is developed and the majority of the islands natural attractions are inaccessible by road. To get to know Kauai best one should navigate the coastline, set off on foot or private tour through its lush interior or take to the air for a breathtaking 360-degree view. 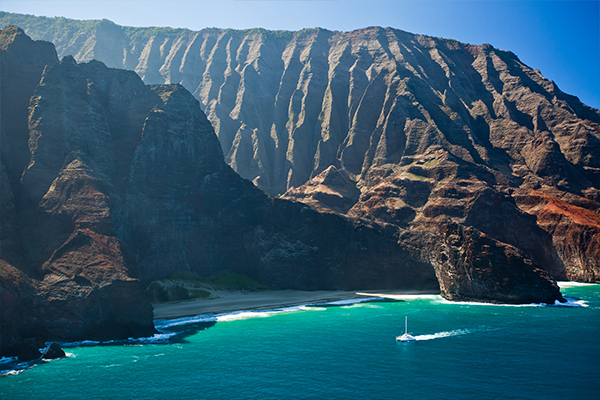 The majority of Kauai’s nautical pursuits happen for one reason, the Napali Coast! Napali means high cliffs in Hawaiian, and that is exactly what you’ll find on the north-west edge of the island. With a rock face rising up to 1,200 metres above the ocean, it’s one of the world’s most photogenic destinations. The bonus is the surrounding sea life where flying fish, monk seals, turtles, dolphins and whales (Dec-Apr) regularly hang out. Sailing and boating expe-riences include snorkel and dive tours, sea cave rafting excursions and sunset catamaran trips. Capt Andy’s, Holo Holo Charters and Kauai Sea Tours are popular cruise operators. 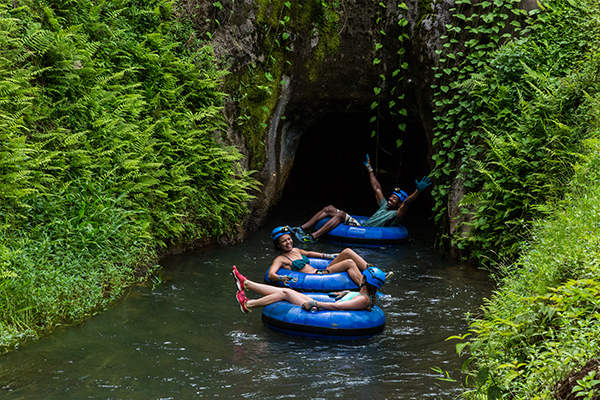 If floating peacefully on an inner-tube while snaking down waterways and through hand-dug tunnels (headlamps safely secured) sounds like fun, it’s time to book a flight to Kauai! Found nowhere else in the Hawaiian Islands, mountain tubing is a highly sought after activity on Kauai and often books out months in advance. This one-of-a-kind adventure is operated by Kauai Back-country Adventures on a former sugar plantation. Anyone lucky enough to tick this off their travel list will gain access to a gorgeous piece of private land that would otherwise be off-limits. 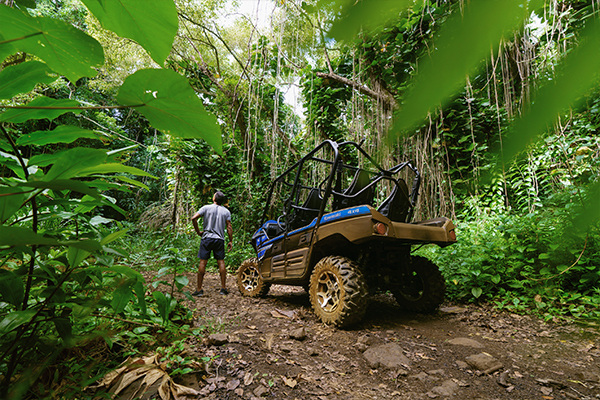 For the perfect off-road escapade reserve an ATV (all-terrain vehicle) and get out into Kauai’s great outdoors! Many of the islands privately-owned ranches and plantations offer 4×4 tours into regions not accessible to the general pub-lic. Off-roading allows passengers to dive deep into Kauai’s beautiful land-scapes. Traverse nature trails, some up to 40 km long, through cow pastures and farmlands, across dense valleys and streams, and surrounded by rich flora and fauna. Panoramic lookouts dot the countryside, and some scenes might look familiar once the film location of famous movies. Kauai ATV, Kipu Ranch Adventures and Princeville Ranch are well-known for their Kauai ATV excursions. One of the most popular things to do on Kauai is ziplining, also known as a flying-fox. Attached to a harness high in the sky riders propel along cable-lines zooming from one tower to another over Kauai’s thick rainforest cano-py. This is an exceptional way to get a birds-eye view of the island. 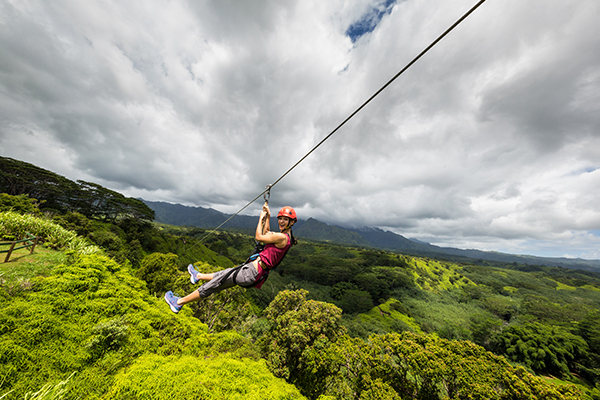 There are six zipline courses on Kauai, visitors can leap into the air with Just Live! Zi-pline Tours, Kauai Backcountry Adventures, Koloa Zipline, Outfitters Kauai, Princeville Ranch Adventures and Skyline Eco Adventures. Outfitters Kauai has the longest zip in the state measuring in at a mega 1.2 km, and Koloa Zi-pline offers a special circuit that starts soaring at sunset and finishes under a blanket of stars. Kauai has a smaller version of Arizona’s Grand Canyon, aptly nicknamed the “Grand Canyon of the Pacific”. Stretching 16 km long and almost 1 km deep, this awe-inspiring valley makes Kauai one of the most intriguing Hawaiian Is-lands to experience by helicopter. 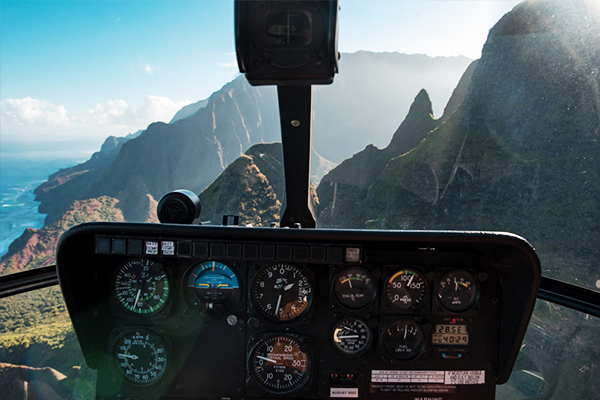 Witnessing the Napali Coast sea cliffs from an aerial vantage point is also spectacular. For a once-in-a-lifetime exclusive heli-tour fly with Islands Helicopters Kauai, they land at Manawaiopuna Falls, the stunning waterfall made famous in the blockbuster “Jurassic Park”. Other helicopter companies include Safari, Blue Hawaiian, Mauna Loa, Sunshine and Jack Harter Helicopters.